It’s been a cold and loonngg winter, so naturally I’ve been daydreaming about warmer times. And trying to convince myself they actually exist. Could it really have been that warm? In an effort to remember, I was perusing through pictures from our trip to El Nido last year. With the bustle of the summer we never got around to blogging it, but I’ve found it invaluable to look back at old travel posts and remember the details, so I’ll reminisce in a post. We flew from Seoul to Manila on Cebu Pacific on a 10 PM flight, and of course chose the discount airline that kept the lights on the entire time and blared repeated sales pitches over the loud speaker for Cebu Pacific paraphernalia. For four hours. We landed with a 6 hour layover until our next flight with the intention of sleeping in the airport, but there was nowhere to sleep. The floor was covered with passengers and we couldn’t find anywhere left comfortable or out of the way, so we hung out at a tea shop in a daze until our next flight. We landed in the tiny airport in Puerto Princesa, Palawan with the plan to take the bus to El Nido, but when we landed we were immediately approached by van providers and figured we would give it a go rather than make our way across town to the bus station. Thus we were ushered into a van for the most terrifying five-hour drive, with our driver hurling around corners and honking at dogs in the road without hitting the brakes. We did make it about two hours earlier than other vans. We had already booked a room for our full seven nights there – with three of us it was cheaper for us to get a room and split the cost than to pay for cheaper accommodation at a hostel-like location. We booked at Pura Vida Inn and when we got into town they had our room ready for us. There was a standard double bed and they added an extra twin bed to accommodate the three of us. It was a little overcast when we arrived but we were able to take a walk around town and on the beach without the rain. Our hotel had a beautiful balcony overhanging the ocean and a great view of the bay. We spent our first night at Artcafe, just down the street, having dinner and drinks. 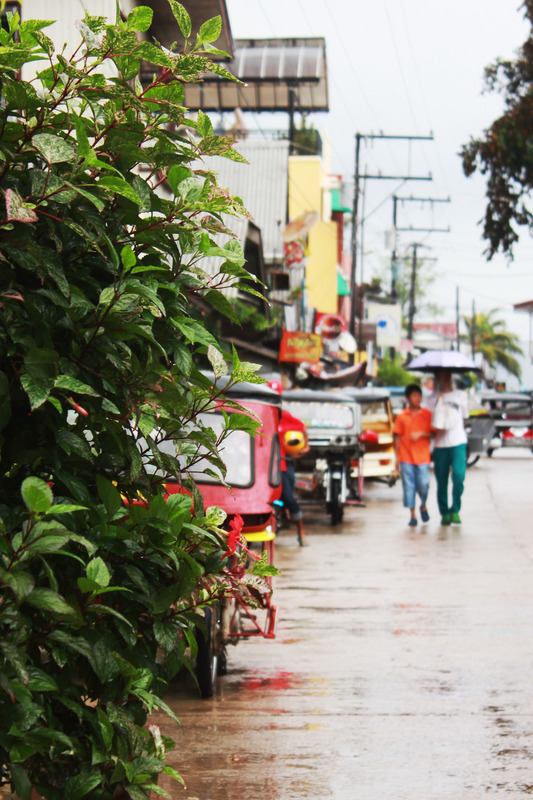 It was rainy season so our first day was plagued by clouds and rain, but it was a comfortable temperature. The first day out we took Tour A, island hopping to local lagoons and beaches. In El Nido, to avoid tour companies needing to lower prices for competition, all of the tour companies in the area agree to a fixed price for similar tour experiences. For the equivalent of about $30, we got an all-day boat tour, including a huge spread for lunch. Our tour started with a foggy morning and choppy waters. Our guide decided to mix up the schedule of the tour because of the waves; one of the stops later in the day was meant to be the “Secret Lagoon”, but our guide was worried we wouldn’t be able to make it in if the water got any choppier. He kept explaining if the water got too choppy we would hit our heads. This image didn’t particularly make sense as we were on a boat with a ceiling. We passed an island where the guide explained people like to scuba dive to see sharks. About one island further he stopped and told us to jump out. We were to swim to the island where they would lead us through an archway into a secret cove. The guide packed up all our cameras in what he said was a waterproof bag and proceeded to jump off the boat. I was a little skeptical at this point. For some reason I really prefer to see the bottom of the water I’m swimming in. And greatly prefer for there not to be mention of sharks just one island over. But we went ahead and jumped in. The water was really choppy, and as he swam up to the little cave opening I could see what he meant about hitting our heads; every time the waves went out there was enough room to go through, but when the waves came back in the filled up the whole entrance. Our guides set themselves up one on each side, and told us to just lie immobile on our bellies as they pushed us through the cave opening. Carissa and I were some of the first to go through, and when Ryan emerged he had blood running down the side of his head; he had hit his head on the top of the cave opening as he was pushed through. The guide told him the salt water would take care of it, which it did. We floated around the lagoon, trying to not drop the camera in the water. It was beautiful, with high walls surrounding the greenish blue water. It started raining while we were in the lagoon and we only stayed about 10 minutes before they shoved us back through the hole again and we swam back to the boat. The water was even choppier on our way back and the swim was exhausting, but it was beautiful and felt quite adventurous. The rest of our tour that day was a rainy one, with a stop for lunch on a little island beach and a swim in a turquoise lagoon; the rain couldn’t bother us because we were already soaked. The scenery was breathtaking regardless of the weather, and we floated around in our life vests snorkelling. I felt like a loser wearing a life vest but I also felt pretty lazy, so the life vest won out. The next day there was a torrential rainpour, so we sat at Artcafe drinking coffee and, later in the afternoon, rum and coke. Ryan and Carissa taught me how to play poker, so it was a pretty good use of a rainy day. And Ryan got to rehabilitate his head. When the rain stuck around again the next day we decided to head out anyway. We hired a trike similar to the one below to take us out to Las Cabanas beach. With the rain and washed out roads, it took over an hour to get there and we had to stop for the last part and tramp through the mud. Seeing the left-behind flip flops in the mud, we tramped through barefoot. We spent some time swimming in the waves while our trike driver hung out at the local bar. It was a bit chilly but beautiful, and the beach was completely empty, and when we got out to dry off we ordered fruit and mango shakes at the bar. A small group arrived to surf, showing us up as we were leaving. We heard they had a lot of fun surfing. It did get warmer in the afternoon, but we headed back and got massages in town, accompanied by terribly wonderful 90s pop music. Next time: The rain stops! Wow, despite the rainy season that looks like a wonderful trip! Thank you for linking up with #reasonstotravel! It was a wonderful trip! I’ve loved looking at all the other posts on #reasonstotravel – so many beautiful places! I had to hold my breath for most of this post…..actually I think I’m hyperventilating!! INTENSE. From the no sleeping flight to the head banging, scary shark water. You guys are all such good sports (AND BRAVE). I don’t know if I would have jumped in the water. I had a similar experience once snorkeling in Mexico, where I ended up getting stung by jelly fish and partially paralyzed in the water….I think my water adventure days were over. So nice meeting you and thank you for joining the #REASONStoTRAVEL linkup. It’s open all month and you’re welcome to join in with as many travel posts as you like. Ahh I’m so glad I didn’t know about your jellyfish story before jumping in. I am pretty terrified of water especially when I can’t see it. I’m glad I sucked it up though – it was so beautiful and such a great memory now. Thanks for linking up with #reasonstotravel with such a cool post about one of my upcoming destinations for 2015! El Nido looks amazing and I’m sure I’m gonna love it… I’m always in for a good adventure and you guys had a bunch, despite the crazy weather. What month was it? I can’t figure out rainy season in the Philippines! Thanks for reading Margherita! El Nido was spectacular – I’m sure you’ll love it! Definitely an adventure. We went in late July last year which is in the middle of their typhoon season. We lucked out in the middle of two typhoons but it was still pretty rainy. But also still beautiful! Let me know if you need any recommendations for your time in El Nido – I have so many! !